After twenty years of sculpting the figure, I am still in awe of the process. My mind is still animated with the endless possibility clay as to give. 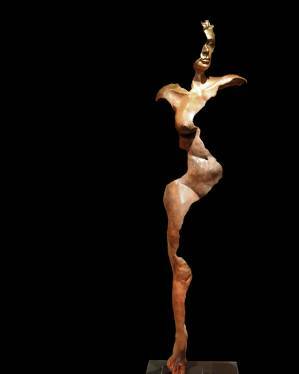 I enjoy the prospect of creating sculptures that touch the human spirit at different levels. My creations usually start with an image inspired by a word, a feeling, a song or a simple thought. Once these words have taken a hold of me, I then start dreaming of ways to bring forth the depth of the emotion they exude. Even as I built the armature, that will soon hold my clay in place, I have visions of the end result. The clay awakens in me the possibility of unlimited expression. My feelings evolve as the sculpture starts to form through my touch. At the beginning I have to be more technical, ensuring a proper base for the figure that will soon emerge. As the sculpture evolves, a kind of respect starts to take form. It's almost as if the figure is now guiding me towards the end result. A result that I will look forward to sharing with a wide variety of people. From the serious art collectors, the rich and famous, the passionates, the students, the artists or the children, I enjoy sharing my technique, my creations and my love of art. From Paris, England, New York, Miami, Atlanta, Las Vegas, Colorado, Palm Springs, Alberta, Ontario, Montreal and Quebec my success is undeniable. Art patrons seem to be drawn to my work and the desire to own one of my pieces is strong. My sculpture are a testament that art has no borders, no discrimination, it is a universal language, a language of love.